"I have had a passion for all things design for as long as I can remember. I studied design in college and have a background in multiple fields in the artistic realm. Ever since I was young, I have had a strong sense for organization, spatial awareness, and attention to detail. I have always loved utilizing all elements of a space to make it functional and attractive. I can't wait to share my skills with you and together create an amazing space!" Jaclyn Kuharich is an exceedingly creative designer with the discipline and passion necessary to bring your dream closet to fruition. 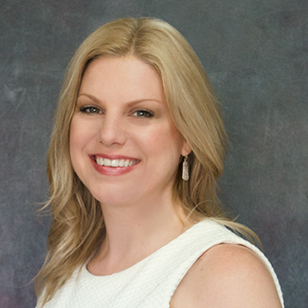 With a strong sense for good design, a knowlege of many styles and the innate ability to listen and understand her clients in order to get the details just right, Jaclyn is ready to transform your space into organizational bliss. 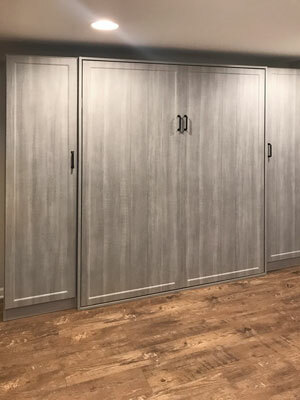 This walk-in closet is the perfect example displaying Summer Breeze laminate in a traditional application — pairing wonderfully with Harmony raised panel drawers. The design has a nice contrast with oil rubbed bronze traditional style handles to accent the design. The closet also maximizes closet corner storage with a Shoe Spinner holding up to 200 pairs of shoes. A built-in ironing board can transform your closet into a multifunctional space — offering plenty of new ways to organize as well as creating a clever and practical space. 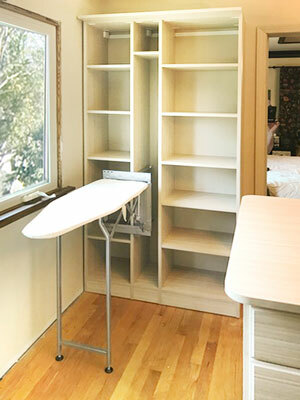 This fold down ironing board example creates a dual-purpose space and also saves a ton of room with its built-in, foldable mechanism. 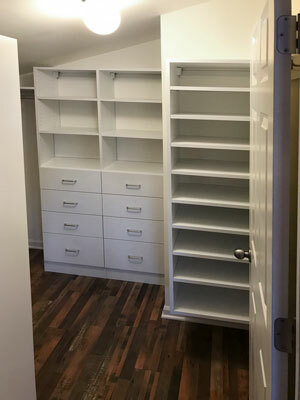 This walk in closet design shows how you can have not one, but two 360 organizers built into a walk in closet to accommodate your storage needs. 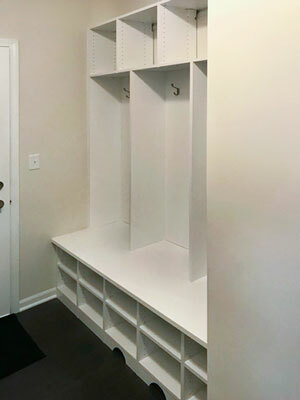 Each 360 Organizer serves a different purpose — one solely for shoe storage, and the other a customized Valet model for more in depth wardrobe organization. 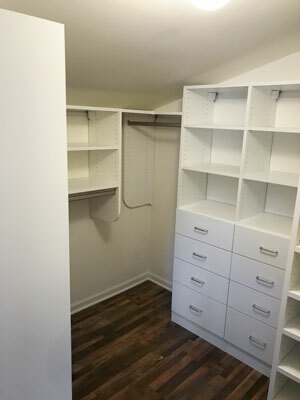 As a way to provide a comprehensive and beautiful design, a small white box was constructed in the corner to cover the pipes that extended into the closet. This strategic design decision offered a solution to having a possible eyesore in the all white, elegant closet. 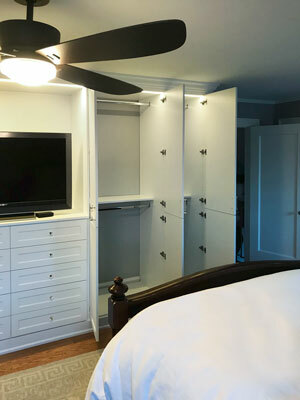 This walk in closet was custom fit to work with the difficult angles of the room. 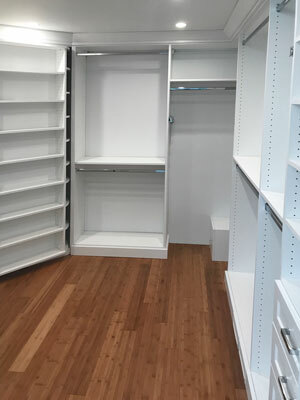 The storage unit rests effortlessly under the slope of the ceiling and maximizes use of this closet. 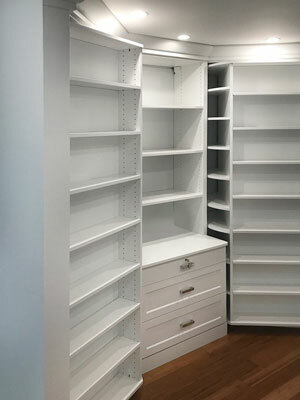 A custom organization system is a great solution to working with a challenging space rather than store-bought furniture. A further look into this walk in displays how the system fits accordingly with the angle of the ceiling. Hanging rods and shelves are offered along the angle — maximizing the challenging space for organization. 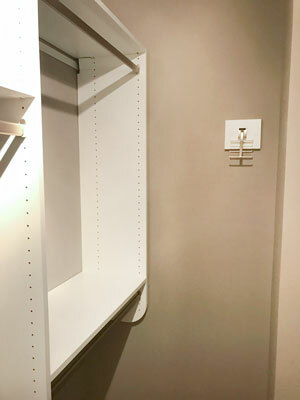 As a unique solution to integrate a useful closet accessory into the organization system, a panel was installed on the wall with an Elite tie hook. The isolated accessory is integrated effortlessly with the aesthetic of the overall closet. This bedroom wardrobe has an overall simplistic design that provides the essentials of hanging rods and drawer space. The simplicity of the function is elevated by LED lights — truly enhancing the form. The doors are doweled together to open as one to eliminate cluttering of separate, open cabinets for each section. Other embellishments include crystal handles on the drawers. 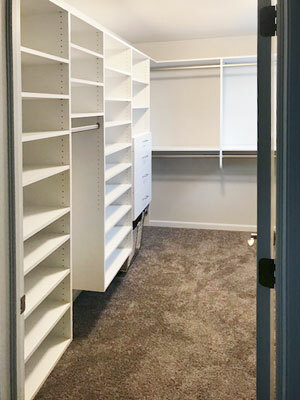 This walk in closet organization system is effortlessly integrated as a suspended system not to interfere with the soft carpeting of the room. The white shelving and double hanging rods are customized to maximize storage for an extensive wardrobe. A convenient pull-out hamper offers a place to keep all dirty laundry in one place and completely out of the way. 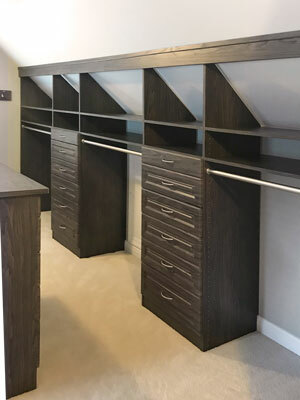 For a clearly challenging space, this custom walk in closet design makes storage look effortless. In our premium Tête-à-Tête laminate with Crescent handles and Harmony fronts, this design masters both form and function. 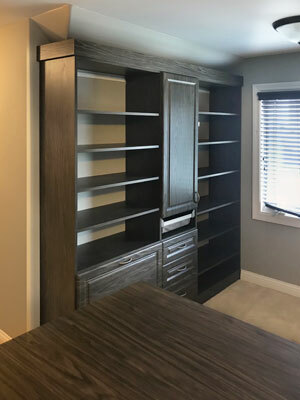 In the same challenging space, this room had a unique wall with a sloped ceiling that Jaclyn was able to accommodate by designing an expansive wall unit. This all inclusive wall unit has shelves, a tilt-out hamper, drawers, and also a center cabinet. From the vintage laminate, glass shelving, and warm LED lighting down to the functional details such as scalloped interior shelving for wires to pass through — this wall unit is a fusion of form and function. 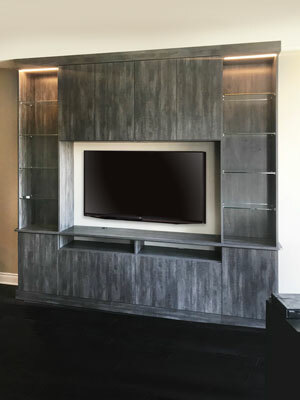 This modern media center offers the room an elegant and unique aesthetic while being the showcase for entertainment in the home. 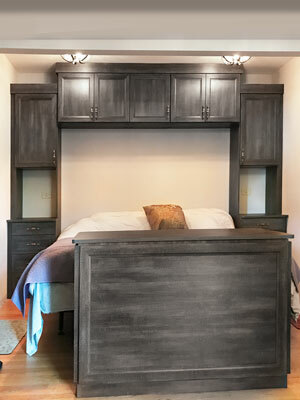 Welcoming an expansive built-in storage design, this master bedroom was transformed from wall to wall. The luxurious cabinets and shelving are a Vintage laminate to offer subtle, textural style. Jaclyn went the extra mile for this couple, designing a storage box counterpart to the built-in unit — a spacious chest with Villa panels and a flip-up countertop. 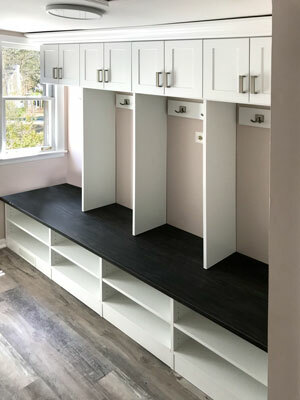 This mudroom design is customized for organization for the entire family and is detailed to work with the structure of the home. Scalloped floor pieces on the base accommodates the floor vent, allowing air to pass through the beautiful, white system. Keeping clutter to an absolute minimum, an assortment of cubbies, shelves, and hooks offers storage for all shoes, boots, and outerwear. This mudroom design has been created as an elegant addition to compliment the features of the room and keep this family perfectly organized. 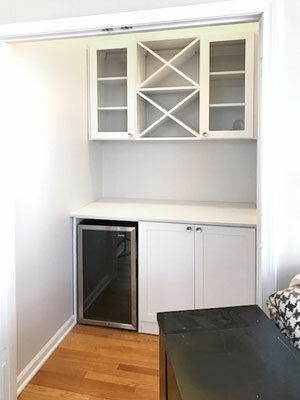 The unit is in a bright white with contrasting After Hours bench seat for some stylish contrast. Keeping clear of the window but also including beautiful crown moulding to wrap the system was a challenge met and overcome. This wall bed is in a River Rock laminate with oil rubbed bronze Emerald handles for a calming, neutral, and natural aesthetic to bring to the basement. The design holds a queen-sized wall bed — becoming spacious and comfortable sleeping quarters for you or your guests. This dry bar design was created as an elegant display for wine glasses, bottles, and various other beverage items. The design has clear glass door Shaker mission cabinets, two wine cubes, and brushed chrome Curved round knobs. To add a unique and textural element, the countertop is a Canvas laminate and the rest of the design is in white.